CCCMB needs your help to get more trail maintenance done when it is needed most. County trails most often need maintenance long before CCCMB can schedule an official workday. Sometimes, especially during rains, trails sustain heavy damage before their turn comes up on the schedule. The most effective way to keep a trail healthy is to maintain it before it is damaged. Regional trail crews are CCCMB's way to make it more likely that trails will get maintained in a timely way and to make it easier for folks to work on trails they love. 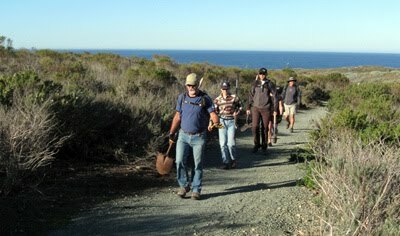 Volunteer regional trail workers can perform quality work on their favorite trails in small groups or individually at whatever time works best for them. Regional crew leaders will help make this happen. Become part of a dedicated team maintaining the trails you love. After you sign up for a crew, the regional trail crew leader will send you an invitation to join a Google Group so you can communicate with hikers, equestrians, and mountain bikers who also want to help improve these trails. Complete all the steps to accept the email invitation; be aware that you must receive an email confirming that you successfully joined the group before you can send or receive emails. 1. Select your region(s) of interest from the list below and complete the electronic form with your contact information. 2. Contact one or more of the following individuals to register your interest in joining a crew and help keep our trails in fun, rideable shape.